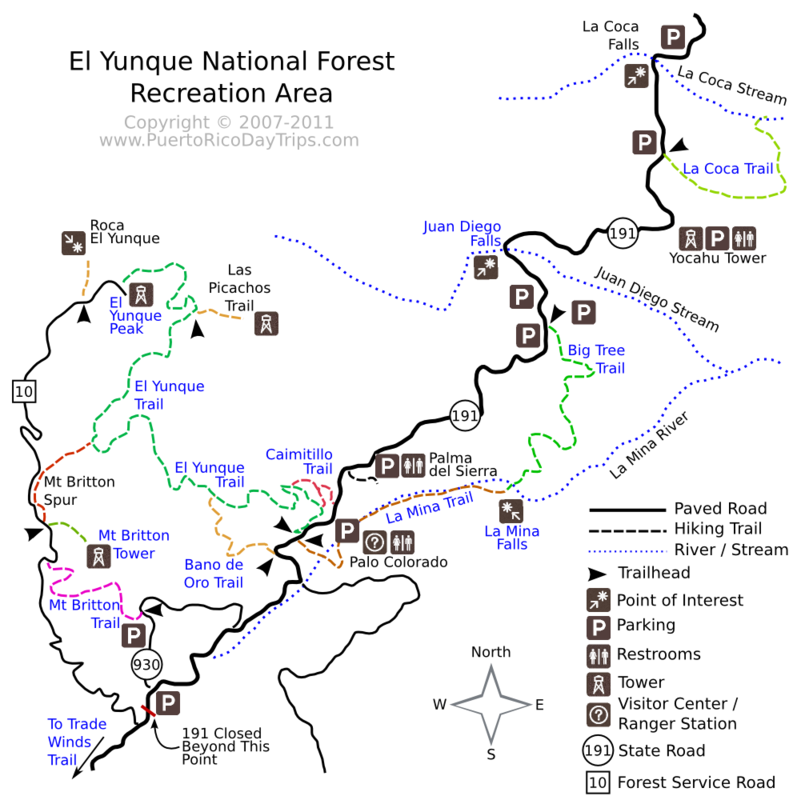 El Yunque is the only tropical rain forest in the United States National Forest System and the largest block in the island, located on the slopes of the Sierra de Luquillo mountains. This is also the place when I truly understood the meaning of rainforest, a place where it does rain ALL THE TIME as a lot of water is needed to preserve the jungle-like setting — lush foliage, crags, waterfalls and rivers. Pack some water, a goPro, a raincoat and tones of patience, because hiking on the rain is not so pleasant but well worth it. The park is packed with tourists, specially during the Christmas - New Year vacation period, so it might be hard to find a parking spot. Be patient and keep driving, the further you go the higher the chances. Once you enter the park, the first stop should be at the Visitors' Center, where you can get some information about the conditions and a trail map indicating the entry points, length and difficulty. We did the Mt Britton trail, that crosses through a cloud forest - where you are indeed inside the clouds, but then we ended up continuing all the way up to El Yunque Peak which is another trail slightly longer. On the way back, we walked the Mina Falls trail which is very short and can be wrapped up with a waterfall bath. I did not go into the water but Enrique did. For me, it felt it was too crowded. At that point I was wet already, because of all the walking under the rain in the morning, all I could think of was the drive back home, a hot shower and a dinner with wine. Still, looking back... One of the starkest memories I keep from this trip to Puerto Rico are the views from the cloud forest. Couldn't see much actually, but felt completely embedded in the sky.